We emailed Swirlz, and they had a lot to say! Most of what's below comes from Pam Rose of Swirlz. See their website for more information. How long have you been baking, and when did you first get the inspiration for Swirlz? How did the four of you come to own and operate Swirlz? Of the “Four Unlikely Friends,” none of us actually does the baking for the store. We have an amazing pastry chef. Margot, who owns a marketing company, bought a spa weekend at a charity auction and asked me (I worked with her in her marketing company) to go along. That weekend Margot had a cold and just caught up on reading a stack of magazines. I worked out like an animal, Margot lost weight. Guess who did not? She read the now famous article in New York magazine on the cupcake wars and then passed it along for me to read, convinced that cupcakes was a topic worth knowing more about. We drove back cupcake-inspired. Since Margot was Celiac and gluten intolerant, she had never tasted a commercially bought cupcake. As Margot and I started to learn more about the cupcake world, we were introduced to Brandon, an opera singer, and Neil, owner of both health care and respiratory consulting firms, who were also interested in cupcakes. The four of us thought that with our diverse backgrounds and skill sets, we felt confident that together we could build a strong brand and open a wonderful cupcake store. How long did it take from that moment until you opened, and why did you decide to focus exclusively on cupcakes? It took one year from conception to open. 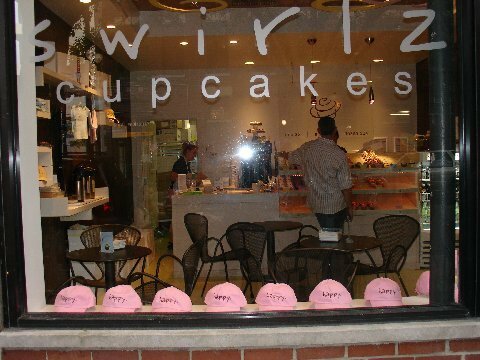 The decision to make Swirlz a discrete cupcake store was a marketing decision. We hear people say, “It’s just a cupcake.” That type of statement indicates that they may generally have low expectations. 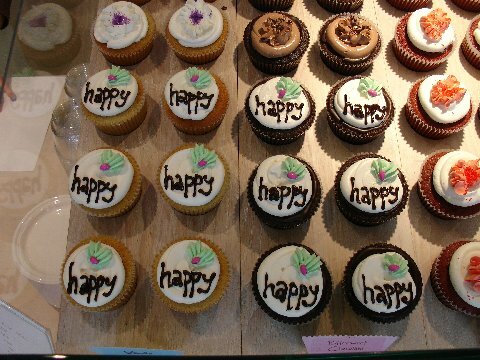 Our philosophy was that we wanted to bake the best cupcake possible and create a strongly branded product. You have an “anatomy of a cupcake” on your website. Is there any part of the cupcake that’s more important than another? What makes a good cupcake vs. a bad cupcake? This is a loaded question for cupcake lovers. When we developed our recipes with our pastry chef, we were looking to create a cupcake that was different from what was already on the market. With cupcakes, a lot of the taste relies on the cupcake to frosting ratio but it’s the “anything else that goes between the cake and the frosting” that serve as the “highlights” and make the cupcake more dynamic. Swirlz cupcakes are traditional buttermilk cakes, topped with either a ganache or a curd and finished off with a delicate whipped Italian butter cream. Our cupcakes offer a unique taste sensation. As a customer of ours from Gourmet magazine commented, “Swirlz cupcakes are delightfully unexpected.” One bite into our cupcakes reveals many hidden taste treasures. The incredible balance of our cupcakes is the secret to what makes us so unexpected. When you’re done with a Swirlz cupcake, you want more. Our size is generous but not overwhelming. We thought carefully about both the size and anatomy. Ganache, for example, is one of the most versatile recipes in a pastry kitchen. It is both the simplest and most decadent. It may be the chocolate center of a truffle, the icing on a cake, it may be whipped and a multitude of flavors added to it for a mousse. Ganache always adds a rich chocolaty taste and texture. We don’t make it overly sweet or gloppy. Swirlz adds a thin layer purely for its punch—our own Swirlz zing. Curd can be a weird word for people but as used by Swirlz, it always equates to fresh. Lemon curd is made from fresh squeezed lemon juice and it’s tart and sweet with a complexity all its own. We strive for many components: First you sink your teeth into a mixed bite of cake with frosting⎯your ratio depends on how large the bite. The mouth feel starts out as light and buttery and it’s a flavorful taste. Soon you are experiencing the creamy, soft whipped Italian butter cream as it rolls over the lips, palate and tongue. The cupcake has now presented itself and just when you think you can go, “Mmmmmm” you are surprised by the unexpected taste sensations. Balance. Balance makes the cupcake special. There is also a huge difference between rich and fatty. To bring out the richness, we stress contrast. This is what gives you a more rich mouth feel. People say our frosting is “light and rich” and it’s hard to imagine achieving both but it is in the mouth feel. Our cupcakes are not for everyone⎯we know that. This is no simple grocery store, box-mixed sugar fix here. Our cupcakes are not what many people have “come to expect.” We don’t make yellow cake and powder sugar frosting. Swirlz butter cream alone has 4 ingredients: egg whites, sugar, premium European butter and pure Vanilla extract—yes, the fancy kind. People who care about Swirlz qualities will welcome them and others will just be surprised. But face it: People will always like cupcakes—no matter what. We understand this and don’t take ourselves too seriously. We feel that we have defined who we are, though. Is there anything specifically Chicago-related about your cupcakes? 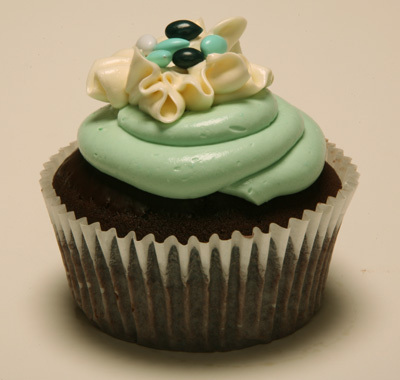 Cupcakes are currently subject to a lot of hype that extends to both coasts and beyond. What we hear back from our customers is that we have beautiful cupcakes and packaging, the store is warm and inviting, the staff fun and friendly (our store won the 2007 award for "Ten Best in Chicago for Superior Service" and our cupcakes—are plain old yummy with a capital “Y.” Swirlz steps beyond the hype and offers a great tasting product. We depend on a loyal following and repeat business. Let’s face it⎯people from the Midwest are known for being practical. If we didn’t offer great cupcakes, people would not be back for more. And hey, the pizza guys down the street love our cupcakes, the local hot dog/fry joint loves them⎯the martini bar loves them, the kids from the local kindergarten adore our Vanilla on Chocolate⎯we appeal to everyone. Your cupcakes are uniquely decorated with several layers of frosting and colorful additions. How long did it take you to perfect this look, and how important do you feel the design of a cupcake is when it comes to marketing them? Swirlz cupcakes is all about gourmet fun. We went through several incarnations of our garnish design, but I think we were sold on the first round of cupcakes created by our talented pastry chef. Our cupcakes have a distinctive look, are complex and balanced and are extremely desirable to our customers, who order our cupcakes for corporate events, extravagant parties, weddings, to Sweet Sixteen parties and Quinceañeras. They all like how special we make every occasion feel. Image via Gapers Block - "Dining Out With Celiac Disease and Food Allergies"
Your flavors include banana nutella, malted milkshake, and chocolate turtle (chocolate cake, bittersweet ganache, caramel butter cream with toasted pecans and a caramel drizzle). Which flavor is the most popular, and do you have plans to introduce new flavors? Customer flavor favorites vary with the seasons. Red Velvet holds its own at all times, but at Swirlz, we introduce a chef’s surprise every day. Some flavors repeat because of customer requests (sometimes actual begging!). 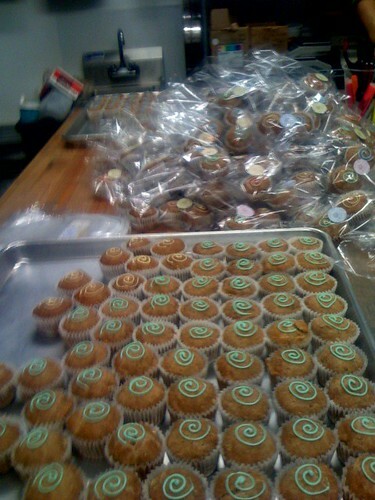 We have already created and sold over 285 flavors of cupcakes. We have a loyal following of people who come in daily just to sample what we’ve baked that day. Our “Childhood Favorites” collection has been widely successful (as seen in Daily Candy), which consisted of a PB & J, Malted Milkshake and S’Mores, as was our Tea and Tropical collections. Our own Swirlz tea box consisted of varieties of Vanilla Chai, Green Tea and a bold yet delicate Earl Gray. Our Tropical collection was originally created for a bride and groom who had been married in Hawaii and returned to Chicago for their reception. They wanted to recreate the tropical flavors that they had experienced. Our pastry chef brought their wedding to life with Chocolate Passion Fruit, Coconut Mango with candied hibiscus flowers, Piña Colada and Pineapple Pineapple. We look forward to 2008! You offer one gluten-free cupcake flavor each day. Are a lot of your customers requesting gluten-free items? Partner Margot Chapman suffers from a gluten intolerance so when we were first developing the store concept, we felt it would have been lame of us not to include this underserved market in our daily offerings. Margot had to be able to taste along with us! As a result, we have established a large and loyal following of gluten free customers from all over the country. We don’t ship them yet but people send friends, spouses and business associates on road trips to bring them back. We established our baking protocol with guidance from the leading medical Celiac group in Chicago. Is there a typical Swirlz customer? Do you get a lot of walk-in traffic or are people mostly seeking you out? As well as having a very unique cupcake, we are also fortunate enough to have a very unique location, which affords us an extremely varied demographic. We are directly across the street from Children’s Memorial Hospital and as their neighbor, we have partnered with them on several charitable events since opening ours doors. As a result of our mass exposure at a large medical institution, we not only have our “regular” daily business, but we have a steady following of Chicagoans as well as out-of-towners seeking treatment. We have the most amazing stories to tell about our experiences—we have become an “oasis” of sorts to those seeking a break from the hospital environment. We have celebrated births, mourned losses, comforted parents and grandparents, hugged our nurses, and been part of lives facing extreme crisis. It puts what we do in great perspective. We are also down the street from DePaul University; we have students coming in all day, studying, making use of our free Wi-FI. They are a joy to us; so many young people. On any day, we are host to people of all ages and socio-economic backgrounds. Do you do catering, and if so, how far in advance should someone book you? Do you do custom cupcakes for large events? What’s been the most interesting event you’ve catered? Yes, we do quite a bit of catering. Swirlz does the most beautiful weddings, nearly every weekend—my favorite was the Hawaiian one. We do more corporate events though, and yes, we design and create custom cupcakes but we always try and remain true to our brand also. The requested lead time always depends on the quantity and we’re very accommodating. I think one of the “most interesting catering jobs” was the one we did for a local Chicago bank celebrating their 125th anniversary. 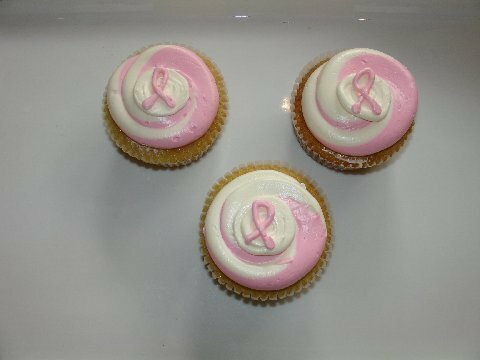 As a thank you to their employees, the bank sent out over 9,000 mini cupcakes, being delivered concurrently to 217 locations. The Swirlz team baked, coordinated the flawless deliveries and never skipped a beat in the store’s usual production. It pushed our group to operational limits and brought us all together in ways that will never be forgotten. To keep morale high for the nearly 48 hour time commitment, we had a 3:00 a.m. celebration buffet on the morning of the delivery, consisting of all fresh fruits and homemade biscuits, sausage and gravy! By the time all the deliveries had been made by 5:00 p.m., we collapsed. Swirlz has become a family. What’s your dream cupcake catering job? Our pastry chef contends that his fantasy job would be an event that celebrated being in the company of his “dream-team” of pastry chefs. He states, “Because a chef will truly have an appreciation for the most wonderful, simple food, executed well, as opposed to a fancy 5-Star dessert that misses the mark.” Jeremy kind of already was able to fulfill this fantasy when Swirlz was a participant in the 2007 “Chefs and the City” event (Swirlz Cupcakes was a prominent dessert presence at the Vital Bridges http://www.vitalbridges.org/ event; a multiple services agency for assisting those impacted by HIV and AIDS). “My fantasy catering event – Barack Obama being inaugurated as president,” says Margot. 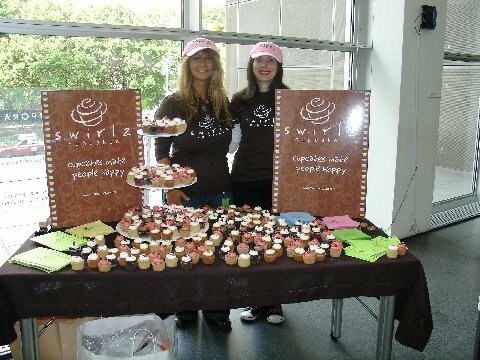 As “cupcake pushers,” we all “dream” of that star-studded, attention-grabbing, media-frenzied, opulent event but as I mentioned previously, our unique location has allowed the team at Swirlz a more unusual perspective—on almost a daily basis. When I reflect over the catering jobs of the past year: Swirlz executed over 9,000 pieces delivered concurrently on one day to 217 locations all over Illinois and Northern Indiana, our pastry chef was the CRAZY host to the Museum of Contemporary Art’s 2007 annual dog costume pageant, “HOWLoween”, Swirlz “catered” the treats for a PAWS (the City’s largest no-kill humane organization) soiree, we provided 500 custom Pink Ribbon cupcakes for the October Lynn Sage Breast Cancer Fundraiser hosted by the wildly fun and exciting Fran Drescher⎯but I personally still come back to a tiny, tiny cupcake party hosted by Swirlz in our first few months of business. Fantasies and dreams mean different things to different people. My dream cupcake catering job has already been fulfilled. We opened at the end of September in 2006. Starting in October, a young woman would come in, get at least 2 milks and once in a while a cupcake and bury her face in her laptop. She was very shy and barely spoke and would stay for hours. Weeks went by and she’d sit in front of the now steamed up fall/winter windows. One day we finally spoke and we came to know that she was a doctor and her infant daughter had been born unexpectedly with Down’s Syndrome. The baby was at the children’s hospital across the street so we were a convenient and friendly safe-haven and a comfortable place to work. On the day that her baby was to be released to go home, it was discovered that the child had leukemia. Through all these obstacles, this young woman never let her situation bring her down—she remained hopeful and optimistic⎯even when the latest setbacks were discovered. Another ten days went by and it was determined that she and her husband could finally bring their daughter home. The Swirlz team put together a small party of sorts—it consisted of a few simple baby gifts and some cupcakes. It was frigid out so the baby had to stay in the heated mini SUV to stay out of the elements. When we opened the door to their car, here were two of the happiest and most proud parents I’d ever witnessed (and I’m a parent myself) and the most beautiful pink-faced baby girl I’d ever seen. As a party of few, we all knew that this young couple had given us one of our best Swirlz moments. We were humbled. What are your busiest hours of the day and week? It’s so unpredictable that we actually keep a store pool going to see who “wins” for predicting case pars most successfully. 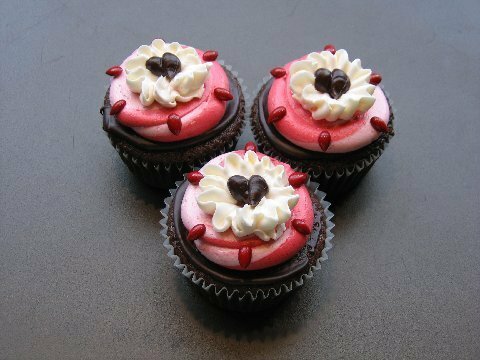 Will you be offering any special Valentine’s Day cupcakes? and a ganache heart on top. For your sweetheart, our Pastry Chef will be on hand to custom pipe a Valentines message in chocolate -- Valentines Day (Thurs. 2/14, 10am-7pm). Available in Chocolate, Vanilla or Red Velvet only. These cupcakes exude decadence and perfectly illustrate the balance that I have discussed. You say on your site that you’ll start franchising Swirlz this year. Can you give us any insight into where we’re likely to see the next Swirlz? We look forward to sharing this information in the spring of this year. Why do you think cupcakes have become so popular in the last few years? Because they make people happy. This is quite incriminating…I’m the worst offender. It’s a running joke in the store that “Pam” isn’t in the store for more than , oh…I’d say 15 minutes before a taste of the daily surprise isn’t being sampled. I contend that I taste for quality control. (Great excuse) Neil and Brandon are known to not resist and Margot does love those gluten-free lemon. The best thing about eating cupcakes is that they truly make people happy. Margot owns a marketing company and has worked on products in every category and has never worked on something that makes everyone happy. Having a cupcake store is the most unique retail experience that one could ever imagine. Customers are happy to come in, no one complains, even if there is an occasional slip up with a flavor or a delivery. Swirlz makes it right. We have great staff here and we all go out of our ways to make sure every customer has had a good experience. We are very proud to have won the Customer Service award that I previously mentioned. Our current “Childhood Favorites” group, consisting of PB&J, S’Mores and Malked Milkshake are real contenders because to Margot and me they are so nostalgic. Neil agrees with the neighborhood cult: Banana Nutella and Brandon says that Banana Nutella, Chocolate Passion fruit and Peanut Butter Chocolate are tied in his book. My absolute personal favorite though, is Mexican Hot Chocolate with candied jalapeños and cinnamon frosting while Margot indulges in the Lemon Gluten Free. Cupcakes are cupcakes. Let’s make no mistake. Cupcakes are moist, fabulous, sweet treats—a portable indulgence. Do I love a giant lemon meringue pie? Hell yeah. Do I occasionally eat cookie dough out of a tub….absolutely, who doesn’t? And ice cream is ice cream⎯a food group of its own. Cupcakes are just fun though and when eaten with friends, it’s happy times. To our pastry chef, though, perfect cupcakes are a serious business of taste and balance. This was a hard question to answer. We tend to think cupcakes are the perfect food⎯that’s why we got into this business. With anything, of course there is always room for improvement, but with a cupcake⎯you can put it on a stick, dip it, fill it, slice it, layer it⎯all kinds of crazy stuff⎯but then when does it stop being a cupcake? Does it lose its identity? In general, consumers tend to want what they know. We set out to make the best cakes and frostings that we could. We think we have, and maintain that “sometimes simple is the best” and the fact that we bring our gluten-free and reduced sugar cupcakes to under served markets is tremendously satisfying. I bake all the time but we leave the real deal up to our pastry chef. My personal specialty is homemade ravioli. Brandon can't remember exactly how old he was, or the flavor of the cupcake but his first memory is quite clear: Brandon was so enthralled by this new food that he has fond recollections of eating the cupcake and then chewing the paper to extract every possible remnant of cake and still not letting go of the precious sweet paper---keeping it in his mouth until it had almost dissolved! Hooked for life! Pam: My grandfather was a professional chef at a very famous Chicago hotel but my grandmother was the baker of the family. For birthdays, she always made us kids her special Lady Finger Chocolate Mousse cake and a baby cupcake version for our party⎯great memories. Margot: My first memories of cupcakes were from a party at about age 5 or 6. I had a birthday cake that was made with a real doll and the skirt was cake and icing. And she was on a serving plate, surrounded by cupcakes for everyone to take home. Margot was in the shop one cold, cold snowy disgusting night⎯did I mention frigid? About two hours before closing time, the weather gods turned against the retailers and it looked as though we may not be selling out that night. Margot passes one of the largest Chicago Police Department precincts on her way home every night so she took along a couple boxes to spread some cupcake love. When she arrived at the police station, a distraught mother and her five children in various states of fear and sadness, were sprawled all over the floors of the area by the main sergeant’s desk, with what looked like to be everything they owned and could carry. Margot approached the officer’s desk and indeed confirmed that the woman was seeking refuge from an abusive partner and they’d left and had nowhere to go. They had been waiting hours for Family Services. 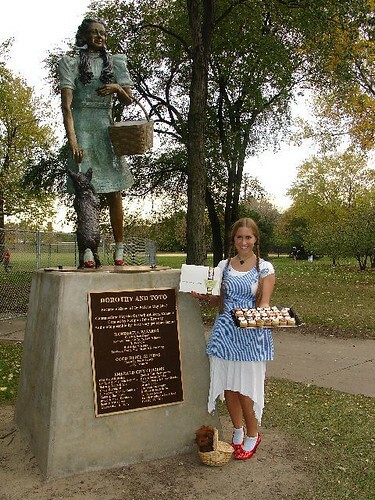 Margot handed two boxes to the helpful officer and then walked up to the mother and handed her the box of beautiful Swirlz cupcakes. The woman expressed her gratitude and she and her children opened the box; within seconds, frosting and smiles were everywhere. Chicago police officers don’t have it easy. This night, Margot brought a smile to everyone’s faces with our little cupcakes. That’s fun with cupcakes. Pam: Living vicariously through Margot’s story. I love the pic of the Valentine cupcake. Can I use it for a Free MySpace Comment?